Angkor, once the capital city of Khmer Empire, is home to over one thousand temples ranging from piles of brick rubble over rice fields to Angkor Wat. Declared a UNESCO World Heritage Site in 1992, through the ruins, you could feel how the kingdom ruled most of Southeast Asia from the 9th to 15th century. 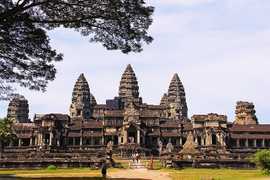 Angkor Wat is a temple complex in Cambodia and the largest religious monument in the world, with the site measuring 162.6 hectares (1,626,000 square meters; 402 acres). It was originally constructed as a Hindu temple of god Vishnu for the Khmer Empire, gradually transforming into a Buddhist temple toward the end of the 12th century. It was nominated as a UNESCO World Heritage site in 1992. The Bayon is a well-known and richly decorated Khmer temple at Angkor Thom. Built in the late 12th or early 13th century as the official state temple of the Mahayana Buddhist King Jayavarman VII. The Bayon's most distinctive feature is the multitude of serene and smiling stone faces on the many towers which jut out from the upper terrace and cluster around its central peak. Built in the mid 11-th century, the Baphuon is a temple located in Angkor Thom, northwest of the Bayon. Surrounded by a wall 125 by 425 meters the central tower was probably gilded wood, which has not survived. The 350m-long Terrace of Elephants was used as a giant reviewing stand for public ceremonies and served as a base for the king's grand audience hall. It was attached to the palace of Phimeanakas, of which only a few ruins remain. Most of the original structure was made of organic material and has long since disappeared. Most of what remains are the foundation platforms of the complex. The terrace is named for the carvings of elephants on its eastern face. Prasat Suor Prat is a series of twelve towers spanned north to south lining the eastern side of royal square in Angkor Thom. The towers are made from rugged laterite and sandstone. The towers are located right in front of Terrace of the Elephants and Terrace of the Leper King, flanking the start of the road leading east to the Victory Gate, on either side of which they are symmetrically arranged. Their function remains unknown. One of the tallest monuments of Angkor, the Ta Keo is a mountain temple built by Jayavarman V, located just east of Angkor Thom. Its five sanctuaries are placed on top of a 22-meter high five-stepped pyramid, from where there are good views of the surrounding area. The pyramid shaped temple was built to represent Mount Meru, the mountain that is the center of the world in Hindu mythology. Ta Prohm is the modern name of the temple built in the Bayon style largely in the late 12th and early 13th centuries and originally called Rajavihara. Located approximately one kilometre east of Angkor Thom. It was founded as a Mahayana Buddhist monastery and university. Unlike most Angkorian temples, Ta Prohm is in much the same condition in which it was found: the photogenic and atmospheric combination of trees growing out of the ruins and the jungle surroundings have made it one of Angkor's most popular temples. It was also featured in the film Tomb Raider. Built in 921 AD, Prasat Kravan is a small temple consisting of five reddish brick towers on a common terrace. It is oriented to the East and surrounded by a small moat. Its exterior is striking for its classical lines and symmetry. Its interiors are remarkable for the large bas-relief depictions of Vishnu and Lakshmi that have been carved into the walls of reddish brick. Banteay Kdei, meaning "A Citadel of Chambers", also known as "Citadel of Monks' cells", is a Buddhist temple located southeast of Ta Prohm and east of Angkor Thom. Built in the mid-12th to early 13th centuries AD during the reign of Jayavarman VII, it is in the Bayon architectural style, similar in plan to Ta Prohm and Preah Khan, but less complex and smaller. Measured 700 by 350 meters (2300 by 1150 feet), Srah Srang is a reservoir located south of the East Baray and east of Banteay Kdei. It was dug in the mid-10th century then later modified around the year 1200 by the King Jayavarman VII. Pre Rup (also spelled as Prae Roup) is a Hindu template mountain of combined brick, laterite and sandstone. It was dedicated to the Hindu god Shiva in 961. The East Mebon is a temple built in 953 AD, in the general style of Pre Rup. It stands on what was an artificial island at the center of the now dry East Baray reservoir. Visitors looking out from the upper level today are left to imagine the vast expanses of water that formerly surrounded the temple. The exceptional sculpture and carvings at the temple includes two-meter-high free-standing stone elephants at corners of the first and second levels. Ta Som consists of a single shrine located on one level and surrounded by enclosure laterite walls. The temple was left largely unrestored, with numerous trees and other vegetation growing among the ruins. Neak Pean is an artificial island with a Buddhist temple on a circular island in Preah Khan Baray built in the 12th century. Its original design was is based on the ancient Hindu belief of balance. Four connected pools represent Water, Earth, Fire and Wind. Each is connected to the central water source by a stone conduit. Preah Khan temple was built in the 12th century for King Jayavarman VII to honor his father. 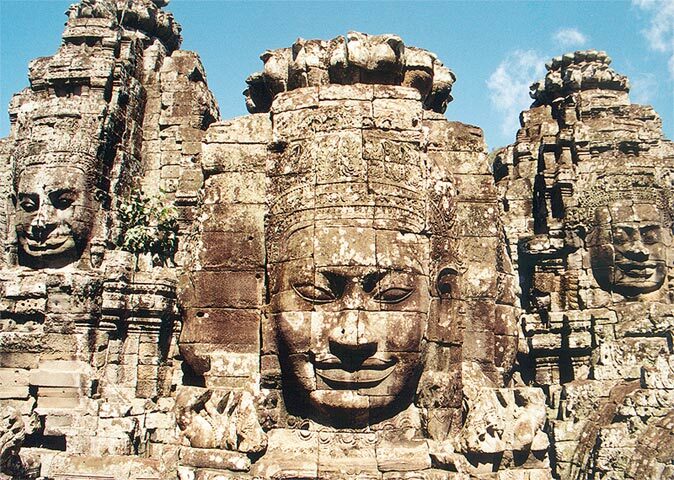 It is located northeast of Angkor Thom. The outer wall of the temple bears 72 garudas (bird-like mythical creature) holding nagas at 50-meter intervals. Phnom Bakheng is a Hindu and Buddhist temple in the form of a temple mountain. Dedicated to Shiva, it was built at the end of the 9th century, during the reign of King Yasovarman (889-910). Located atop a hill, it is nowadays a popular tourist spot for sunset views of the much bigger temple Angkor Wat, which lies amid the jungle about 1.5 km to the southeast. Consecrated in 967 AD, Bantay Srei was the only major temple at Angkor not built by a monarch; its construction is credited to the courtiers named Vishnukumara and Yajnavaraha. The temple is located about 25km (16mi) north east of Angkor Thom, built largely of red standstone, its decorative wall carvings are still visible today. Built as a Hindu temple in the early 12th century, Beng Mealea is located about 40km (25mi) east of Angkor Thom. It is largely unrestored, with trees and thick brush thriving amidst its towers and courtyards. Ruluos was once the first capital of Khmer Empire. Among the "Roluos Group" of temples there are some of the earliest permanent structures built by Khmer. They mark the beginning of classical period of Khmer civilization, dating from the late 9th century. At present it is composed by three major temples: Bakong, Lolei, and Preah Ko.